Back on October 4th, I wrote an article titled: Tether – It’s going to collapse. Mine is just one of many articles surrounding reviewing the wrongness of Tether and Bitfinex. While doing a little bit of position trading and buying, the scuttlebutt surrounding last nights price movements were related to rumors that Bitfinex was insolvent and that Binance was removing Tether (USDT). None of those reports have been officially announced – but it didn’t stop Bitfinex and Binance to see a big drop in the Tether (USDT pair) and a massive drive up in all the pairs on those exchanges. At one point, there was a $500 difference between a regular US Dollar/Bitcoin pair than the Tether/Bitcoin pair. Even looking at the trading at the time of writing this article (1510 CST), there is a $300 premium between Bitfinex and Coinbase for Bitcoin (Bitcoin is trading at 6364 on Coinbase and 6717 on Bitfinex). We broke out of that triangle! Now that’s a pretty sight – Bitcoin breaking the triangle very close to the apex. Could it travel back inside? Most certainly. 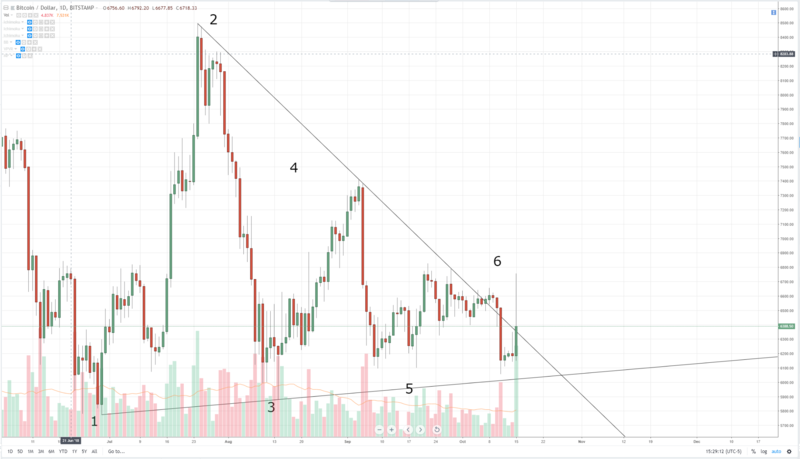 On a faster time frame, we appear to be testing that initial breakout, but nonetheless, we appear to be closing at the downtrend line or above the downtrend line on the daily – with massive volume. 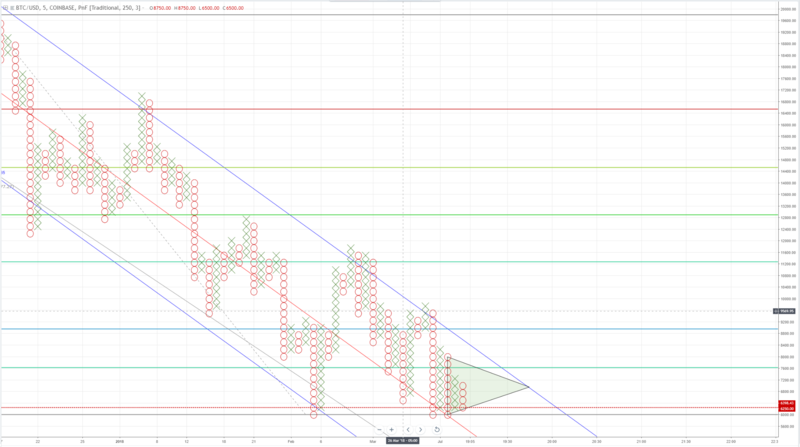 In another chart style, Point & Figure, we still remain in a much large triangle, which would require prices to breakout near the 7600 value area before breaking above this level.